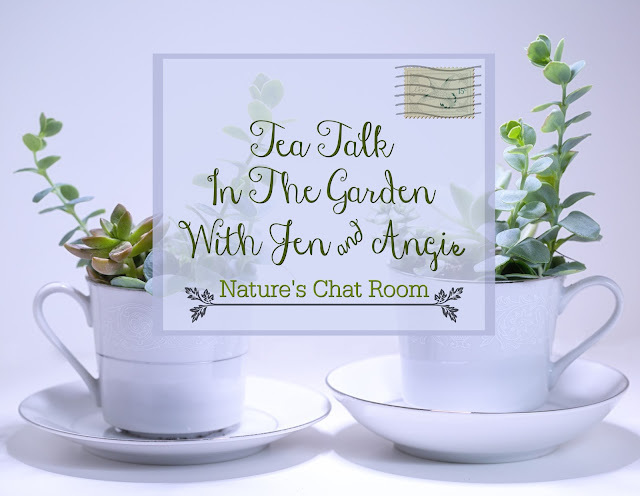 It's time for some Tea Talk in the Garden! So much has happened since I last heard from Angie at the The Freckled Rose, my virtual letter exchange pen pal! Help yourself to the freshly brewed tea and (maybe even a fresh sweet or two!) and join the conversation in the comments section below. We're so happy to have you join us! 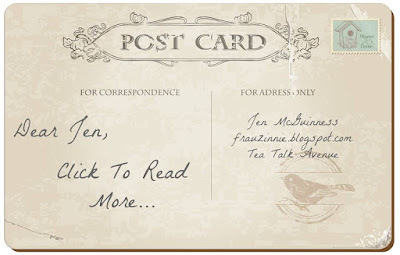 To read Angie's last letter to me, click on the postcard below. So much has happened since your last letter! When you last wrote, the snow was still covering the ground and freezing temperatures were wrecking havoc on daffodil blossoms. So much has changed since a month ago. As I sit here to write you, my window is open and the breeze is bringing in lilac-scented air and the robin's song. It's hard to believe that the cold, nasty weather of winter that refused to leave us is now officially gone. Outside my tree peonies are blooming, my honeysuckle and wisteria vines are about to burst into flower, and the last of the tulips have sashayed their way through the garden. Onto the next performance, they seem to say, as the columbines and irises take the stage. I truly feel that spring is my favorite season, because every day there's further progress in the garden. 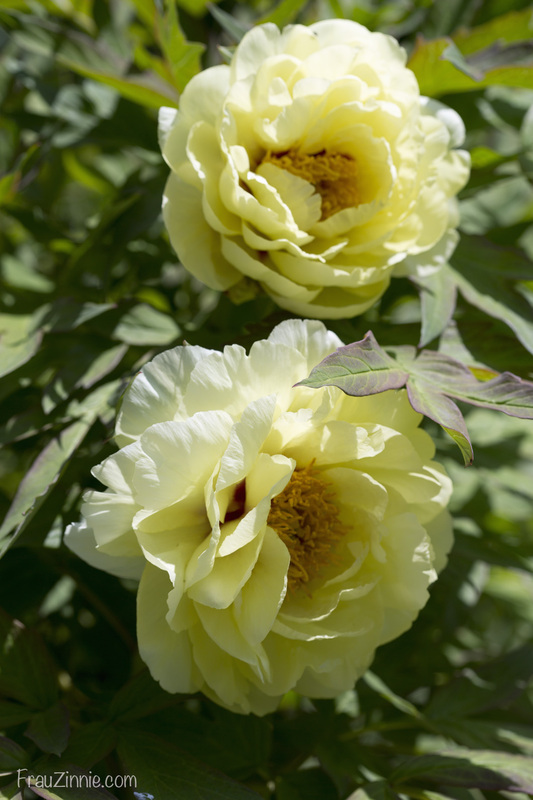 The tree peony is blooming in my garden this week! I am so glad you had success in starting seeds under lights! I do not know what I would do without my grow lights. Even though I had all three tiers filled with seedlings, I'm still stressing about the seeds I haven't started yet. 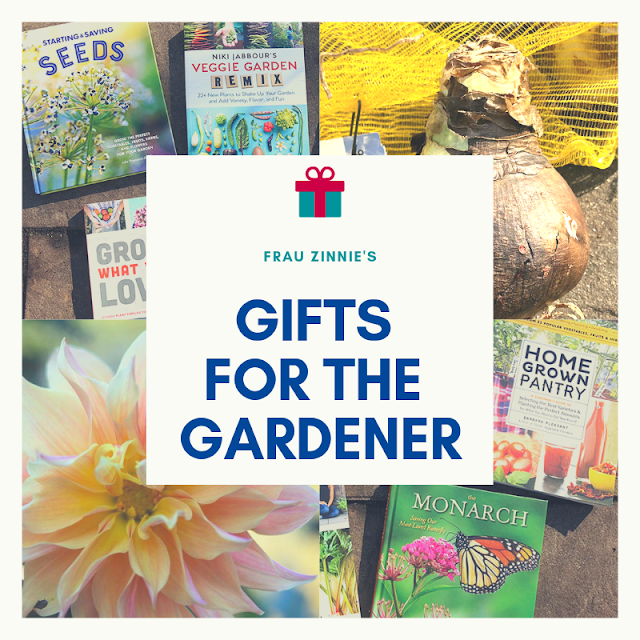 I felt better when seeds I direct sowed outside took a little bit longer to emerge from the soil this year - it makes me feel as if I am not as behind as my mind tells me I am! Speaking of the late start, what a wacky spring we've had here in central Connecticut! Every time I thought the weather would stay warm, we had another cold night. I can't tell you how many nights I moved plants back and forth from the garage to the patio and back to the garage again. I had almost lost all hope of my sweet pea seeds sprouting after I planted them in early April outside and didn't see a trace of them. But then late last week, they started to poke through the soil. So when I begin to stress, at least Mother Nature shows that gardeners just need to be patient and wait until the time is right. And maybe with the crazy weather I am not as far behind as I had originally feared. 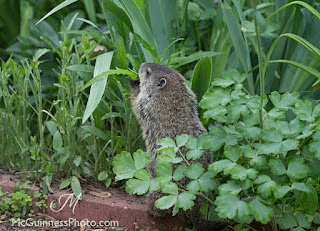 A baby groundhog photographed in my garden last year. 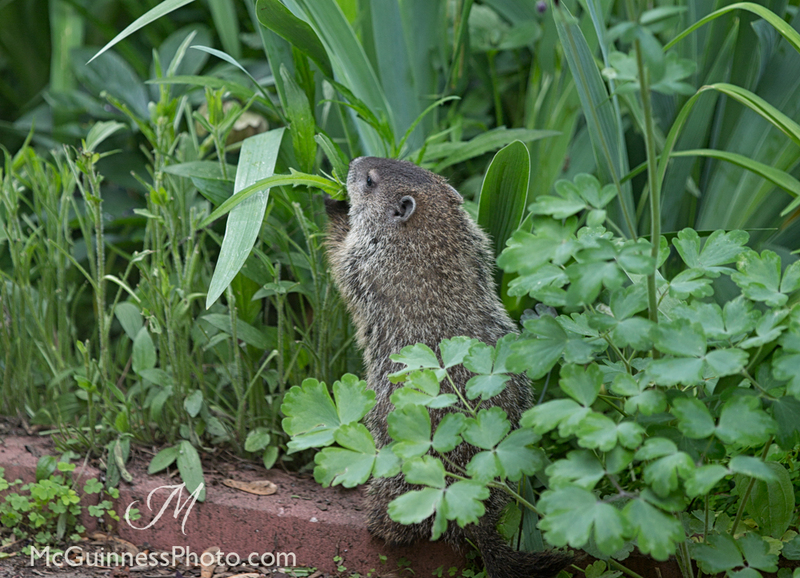 As for critter drama, I've been dealing with a groundhog living under my shed once again this year. After coming home from work one afternoon and finding my baby lettuce plants chewed to the stubs, the Looney Tunes calamity ensued (minus the giant anvil, of course). I began to create a (crazy) blockade to keep the groundhog out of my garden. At first, to discourage him (or her?) from living under my shed, I put up fencing - but I mistakenly didn't dig the chicken wire down into the ground. The groundhog just tunneled right underneath it. I continued to try to dissuade the groundhog from returning to the spot under the shed, with attempts of barricading the entrance with a cinderblock, blocking it with stakes in the ground, and by even dumping Max Rabbit's discarded litterbox on the entrance. Nothing changed its mind. Apparently the living space under my shed has great value in the groundhog community (just great!). I didn't want to resort to trapping (even though I do have a HavaHart trap) since there is not a nearby place to drop the groundhog off. Did you know that a groundhog - if removed - needs to be relocated at least 2.5 miles away (and sometimes people even suggest as many as 5 miles away), or they will find their way back? They are awfully stubborn! I haven't tried to fix the fencing to block the shed because I know he/she is in there, and I'd feel awful if something tragic actually did happen if they were locked in and couldn't get out. So my final attempt - which seems to be working so far - was creating a 6 foot tall chicken wire fence (which this time, I did bury into the ground) that prohibits the groundhog from accessing my back garden, but it does allow him/her to sneak behind the fence into the wooded area behind my property. So far, so good! 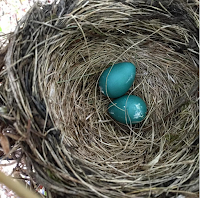 I'm hoping after this nesting season is over - and I can confirm that the groundhog is indeed gone - to fully repair the opening under the shed so it can no longer be accessed. (Apparently this is in mid-July through September.) What a saga! I really do love animals but come on guys, give me a break already! Check out how long this milkweed root is! I would be remiss if I alluded that has been the only craziness. This year I want to really increase my odds of hosting monarch caterpillars in my garden, and I've been trying to raise milkweed seeds like crazy! I scattered SO many in the garden last fall so they could be stratified naturally outside. There's been little luck in that department, which was leaving me so frustrated. I constantly sent photos of random seedlings I hadn't seen before in the garden to my friend Diane who works at an organic gardening center near my town named Natureworks (she's the area monarch butterfly expert). Each time I was disappointed to learn I had some other plant instead of the milkweed. (Most of the time it was pokeweed that I was misidentifying, which must have been sowed by the birds. Funny how stratifying seeds works for them!) Then last Saturday, Diane said I could come to her garden and dig up some baby milkweed seedlings that had settled into her vegetable garden. 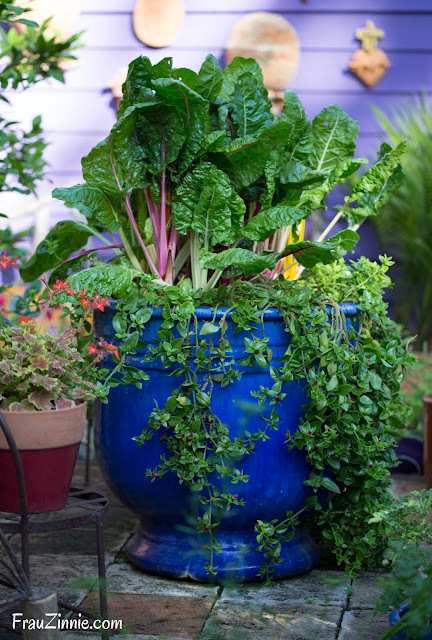 You know you have a great gardening friend when she offers to help you out like that! So we gingerly dug up baby milkweed plants, but sometimes what looked like a baby wasn't an infant at all - instead, in one instance, I unearthed a milkweed plant with a root system that was as long as my arm span! It was crazy - at least three feet long! I am happy to report that the seedlings seem to have transplanted well into my front garden. Keep your fingers crossed so it continues to be the case! 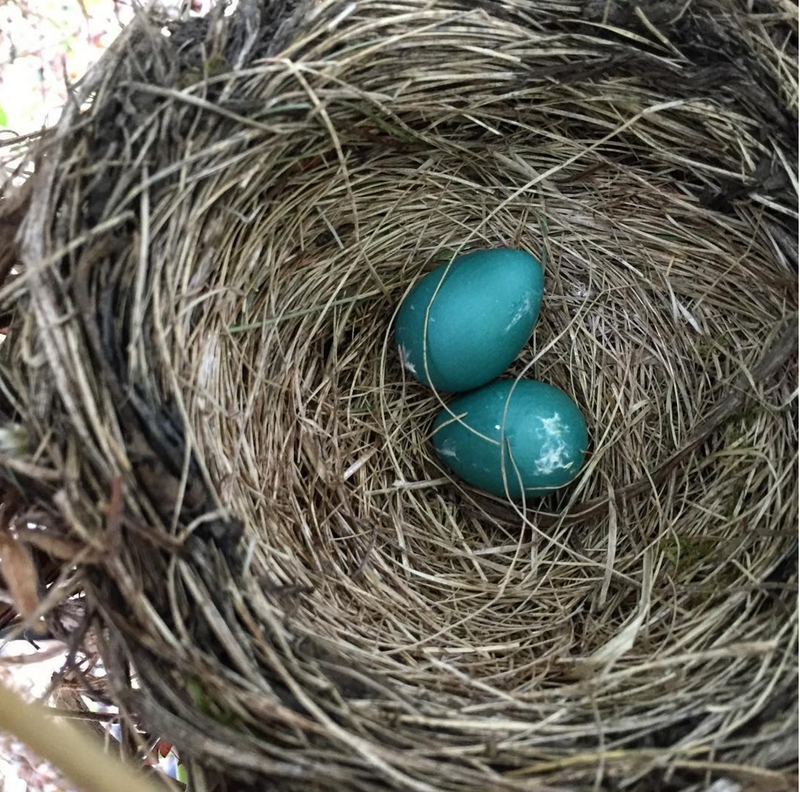 The robin's nest in my garden. Anyway, with the drama aside, I really want to focus on growing more plants for pollinators this year. Are you doing the same? I have even left the dandelions alone this year since they are such an important food source for the earliest emerging bees. I cringe when the lady down the street sprays hers with RoundUp. Luckily, she's far enough away from my garden, but I still worry how it effects the bees that enter here. I do not use pesticides in my garden, and as if rewarding me, a robin family has taken up residence in the front honeysuckle vine. They're expecting twins! 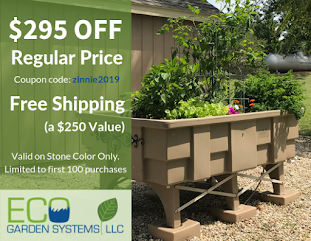 I can't wait to hear what is happening in your garden this spring! Is there anything new and exciting you are growing? Talk to you soon! * Both J Berry Nursery and Proven Winners have kindly provided me with sample plants to trial in my zone 6b garden this growing season.